Money or trees is the choice before the Ghanaian government. The administration is agonising over whether to take the $2 billion offered by mining companies or preserve the forests where they seek to dig. 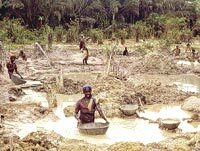 Six companies have offered the fortune to the economically anaemic African nation, five of them for gold mining. But the booty they seek is hidden inside forest reserves. Australian company Newmont has offered us $500 million even before mining starts, and promises to create about 1,000 jobs directly. The firm has discovered gold in two places; but one of them falls inside a forest reserve. The company is adamant that it wants both concessions or nothing. The odd man out, Dutch firm Bhp Billiton, is willing to spend $1 billion to explore for bauxite, the mineral from which aluminium is culled. Ghana has been seeking such an investor desperately to exploit the prodigious volumes of bauxite available in certain regions. But again the mineral lies buried inside forest reserves. Instead of mining in these forests, environmentalists recommend eco-tourism to generate jobs.